If you've ever felt like pulling your hair out trying to get through to your man, you'll appreciate the advice in this communicate with men effectively interview. Believe it or not, it all comes down to science. By following the advice of dating experts Donna Sozio and Samantha Brett, you can learn how to communicate with men and see real results. Their recent book, The Man Whisperer, offers sound advice to women who just don't seem to be able to get the men in their lives to hear them. You may be surprised to learn that it is easier than you might think. In the following communicate with men effectively interview, you can learn how to become a man whisperer and bring out the best in your man. LoveToKnow (LTK): What are the biggest mistakes women make when communicating with men? All men need to feel like they can succeed. This includes the need for men to feel successful in pleasing their women. So when a man decides a woman is "unpleasable" from nagging or criticizing him too much, he will give up trying to please her altogether! Another mistake is not appreciating all that men actually do, which is usually more than we think. When women appreciate a man's efforts to make her happy, men try even harder the next time. LTK: Why is it necessary to communicate differently to get through to a man? D&S: Men's brains are biologically hard-wired entirely differently from women's brains. Therefore, it is imperative that women understand that men don't communicate the same as women do with each other. It's a mistake to expect a man to empathize with your feelings or de-code your nuances, mood, tone, and subtle body language as well as your female best friend can! Instead, men need gentle clear requests phrased in just a certain way that inspires them to take action. This is what Man Whispering is all about. It teaches women a new way of communicating with men that activates his "Good Guy Gene" to happily acquiesce to a woman's requests. The trick is that when you [become a] Man Whisperer, men don't feel like less of a man when trying to please you. In fact, they feel even more manly doing what you ask of them! LTK: Is this method of communication about making everything revolve around the man? How does this help a woman's needs to be met? D&S: Man Whispering doesn't revolve around the man. It actually revolves around what women want! The book teaches women how to present their requests and desires -- in just a certain way -- which inspires men [to] actually want to please you and do what you ask of them for the pleasure of making you happy. This is because Man Whispering teaches women how to incorporate into her request the benefits her man will enjoy when taking action on her request. It's also a gentle way of phrasing requests so men don't feel threatened or criticized. Our Man Whispering communication formula ensures that a woman's needs are met every time and without resentment from her man! When women learn to speak to a man's "Good Guy Gene," it inspires him to want to please, rather than to ignore or refuse a woman's requests. LTK: What is the key to success in communicating with men? And finally, reward him for fixing the issue. While employing these five keys to successful communication with men, make sure to speak in a calm tone, take a friendly stance (no hands on hips! ), and most importantly smile. Smiling while you Man Whisper lets men know they aren't being scolded or criticized so they actually listen and take action and try to please you. LTK: Can these techniques be used in non-romantic relationships? D&S: Absolutely! Man Whispering can be used to communicate with any man in your life, whether it be your plumber, mechanic, brother-in-law, and in appropriate situations [with] your co-workers and even your boss. This communication technique works on all men because it speaks specifically to how a man's brain is wired and leverages a man's desire to succeed. It also gently delivers requests in a way that inspires men to do more for you every time. LTK: What is the most important thing you want readers to know about man whispering? D&S: It's never too late to start Man Whispering. It can turn a relationship around in a week. And it's never too early. This communication technique works wonders on first dates and instantly sparks chemistry. D&S: Trust yourself. And trust the process. Man Whispering leverages the differences between men and women in relationships. It focuses on becoming complimentary, rather than resentful silent score keeping about who is pulling more weight in the relationship. The more women use this communication technique, the easier their life will become as men will naturally start to do more for them. LoveToKnow would like to thank Donna Sozio and Samantha Brett for taking time for this interview. 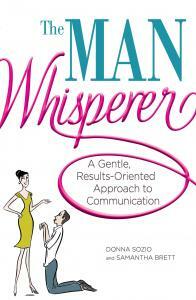 To learn more about effectively communicating with men, check out their book, The Man Whisperer.